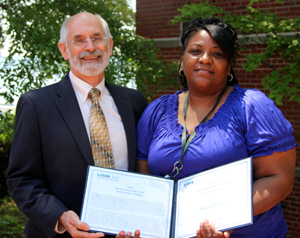 The winner of the 2013 Outstanding Employee for Administrative Support is Ms. Maxine Butler. When things run smoothly it's often because of people working behind the scenes. Maxine Butler is one of those indispensable people for Biological Sciences. Maxine is hardworking, dedicated, and committed to performing her job with 110% effort. She always has a positive attitude, friendly manner, and genuinely cares for the people she interacts with every day. She never hesitates when asked to do something, even when it may not technically be part of her job description. Maxine strives to go above and beyond what is required to make the business of the Biological Sciences Department run smoothly, even in the most hectic of times and in the face of an ever-increasing workload. Maxine steps in and performs the functions that are vital for meeting the needs of everyone in the department. She handles these situations with a smile on her face, without complaint or hesitation. These qualities truly exemplify her dedication and excellence. For all her years of service, her amazingly positive attitude, and her competency and proficiency, Maxine is an exceptionally deserving person for the Administrative Support Award. Her outstanding service to VIMS speaks for itself and the commitment and strength she provides to VIMS is invaluable.